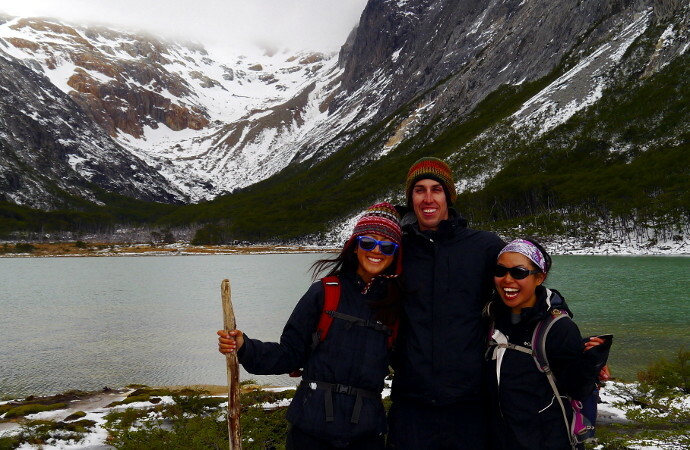 ← Patagonia, Part 2: Glacier Tossing, Argentine Tango, and PENGUINS!!! Part 2 – Glacier Tossing, Argentine Tango and Penguins!!! 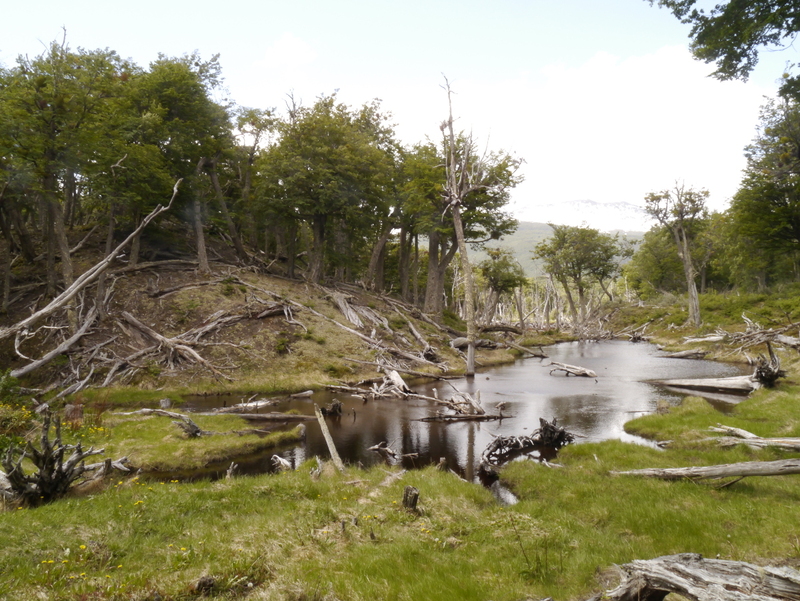 Before taking the ferry to Tierra del Fuego, our last stop was Pali-Aike Park, which means “Desolate Place” in Tehuelche. We could not agree more. Down (yet another!) dirt road we went, ending in an extinct volcanic field. Plains upon plains of grassland, accented with old craters and old lava. With the wind howling, it was hard to appreciate the scenery; there were moments where we really thought we would topple over. 60 yards from Marley, Matt spotted a puma watching us from a distance. We each gripped a volcanic rock to hurl, just in case – fortunately it was an uneventful encounter. A quick 30-minute ferry separates Tierra del Fuego from the mainland. The northern part of the island belongs to Chile, while Argentina lays claim to the south. Never realized how much of an impact wind could have on life, but our efforts to see king penguins were thwarted by wind, so we headed to the border earlier than planned. 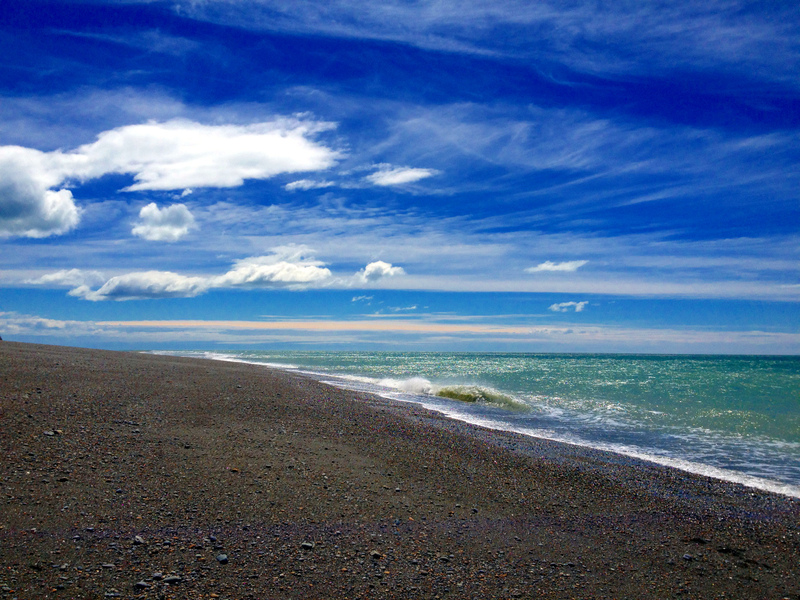 The tides in the Atlantic coast in Patagonia can be as big as 30 feet. We stopped by a bay in hopes of seeing amazing tide pools. We arrived around low tide, and the water level would soon rise again. From the edge of high tide, we walked for 15 minutes and still were not near the water. There were dozens of men carrying large, weighted rice sacks back from the ocean. 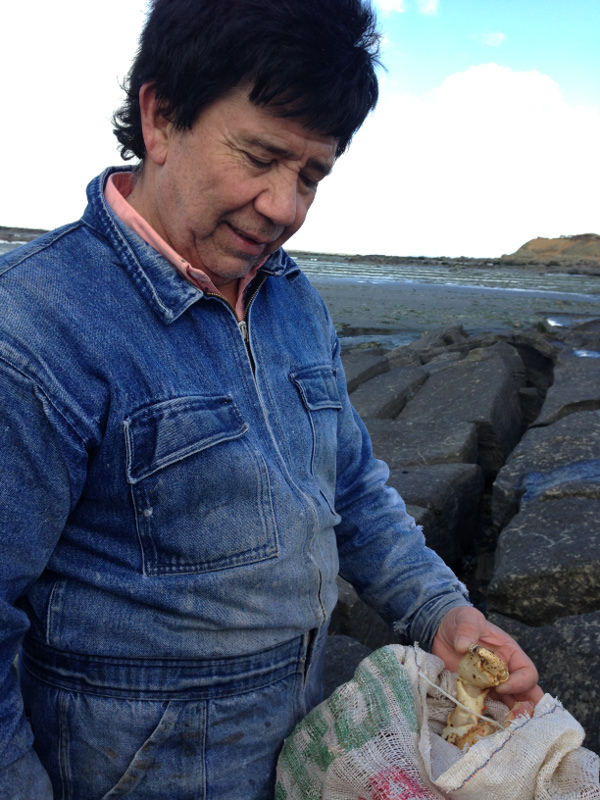 We stopped to ask a man what they were collecting, and he revealed gigantic centollas (king crabs). The men used metal poles to prod the crevasses between the rocks before grabbing them with their bare hands (with battle wounds to show!). He was out catching crab to celebrate a family member’s birthday. It started raining, so we took shelter next to Lake Fagnano, another picturesque glacial lake surrounded by mountains (how lucky are we?!). 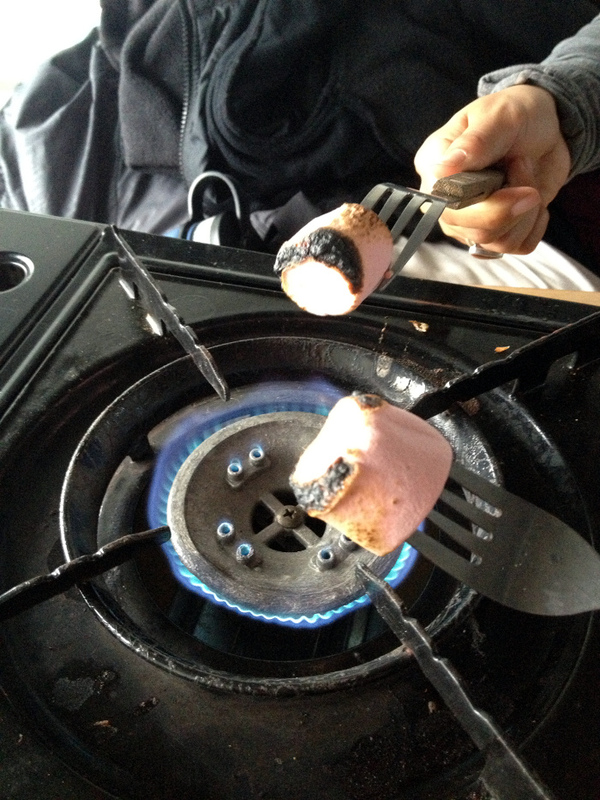 Matt read about a campsite with warm showers (when it is ~40 ͦF and you are living in a van without heating, taking off any clothes to shower and getting hair wet becomes incredibly unappealing.) When we did manage to find hot water, we jumped at the opportunity. Rose was a genius to suggest wet wipes which helped tremendously. Camp Hain reminds me of the movie, Camp Nowhere. 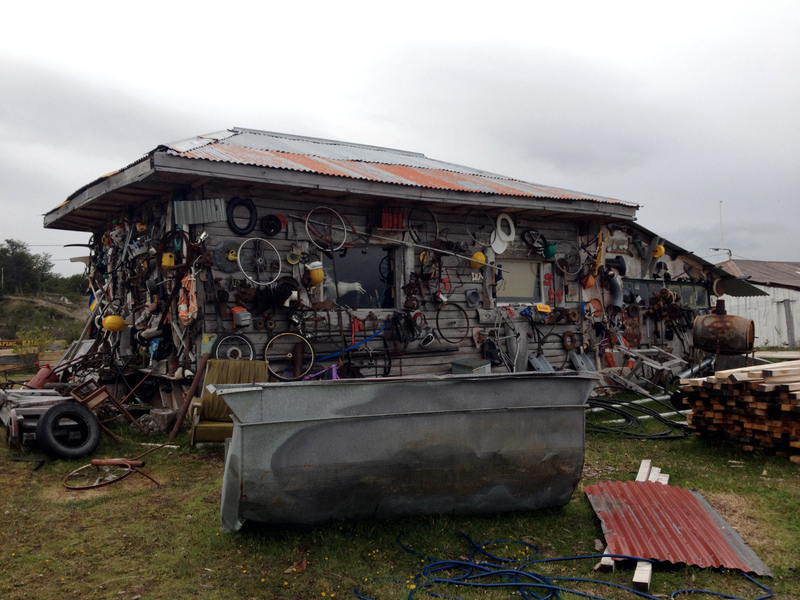 Home decor meets junk yard – the sheds were over decorated with spare bike parts, a toilet seat(?! ), and miscellaneous home appliances.This experience would remind us not to judge a book by its cover, as we enjoyed a scorching (yeah, that’s what we strive for) shower. 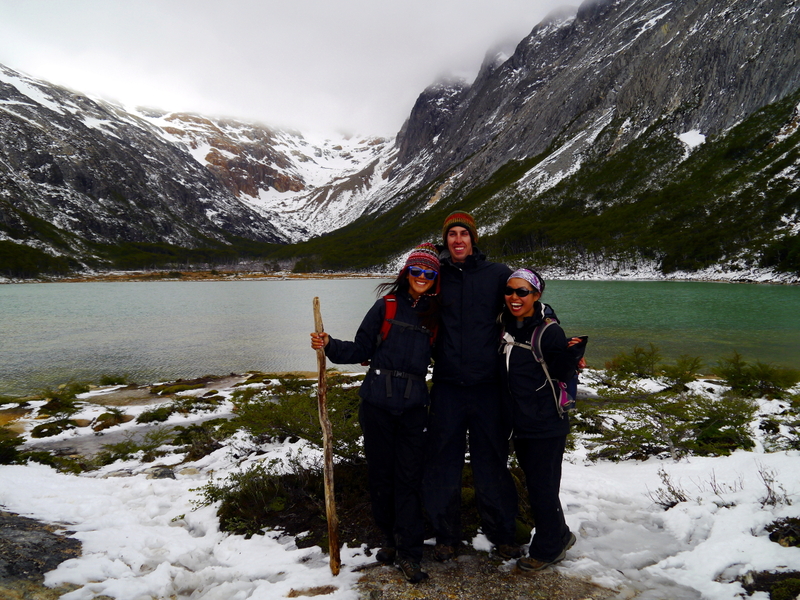 Scrubbed and ready to continue, Laguna Esmeralda was our first hike in Tierra del Fuego. It had snowed the night before; it would be all of our first times hiking through snow, another new adventure! Beavers are an invasive species in Patagonia (originally brought over to boost their fur trade – have you worn a beaver hat recently? Exactly.) and cause millions in damages. But watching them swim around the rivers, back and forth from the shore to their impressive dams was so relaxing. We trudged through to the edge of a swamp – things were about to get very messy. We were lucky to meet a nice group of travelers who shared some warm tea with us before heading into the bog. It was impossible to keep our feet dry (by this point, I had already slipped and fallen a couple times). Triumphant that we made it (with Milo! ), the view at the top was totally worth the puddle hopping. I lead the return hike, but (of course) managed to get us a bit lost. After a slight detour, we were finally back into the forest. The afternoon heat and many other people trekking through turned the ground into a sludgy mud pit. The descents were more like skating, and halfway back, I lost feeling in my feet. 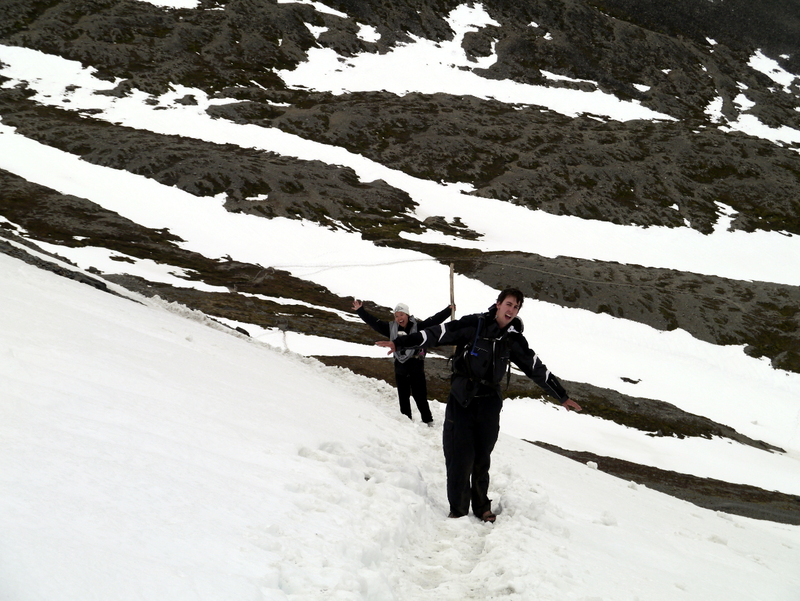 Despite the numb toes, Laguna Esmeralda was a highlight – it was so much fun to hike over different types of terrain. Ushuaia is the last major city before Antarctica! We made it to the end of the world – we had to let that sink in. Much bigger than I expected, Ushuaia has a shopping mall, cruise ships and tourists! Shoes soaked, we went on a much easier hike up Glacier Martial that Matt and I could accomplish in sandals. The first half leads straight up a dry ski run until the start of the mountain trail. After Laguna Esmeralda, the short sections of ice between the paved paths to Glacier Martial were no challenge. The top provided a great view of the city and a chance to watch a group who had hiked with skis so they could ski back down to the parking lot. 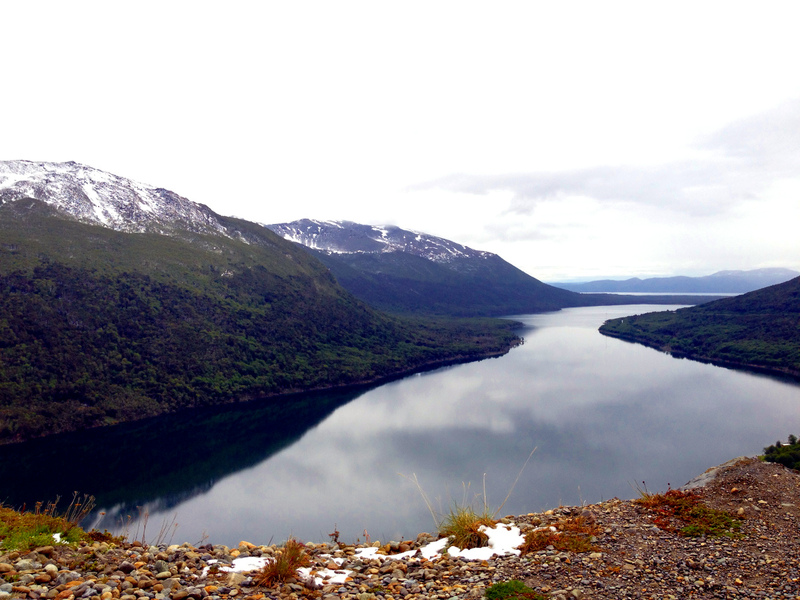 Tierra del Fuego National Park has a few short circuits to walk around. Although not as impressive as the other parks we visited, it was quiet and peaceful for the end of our trip. 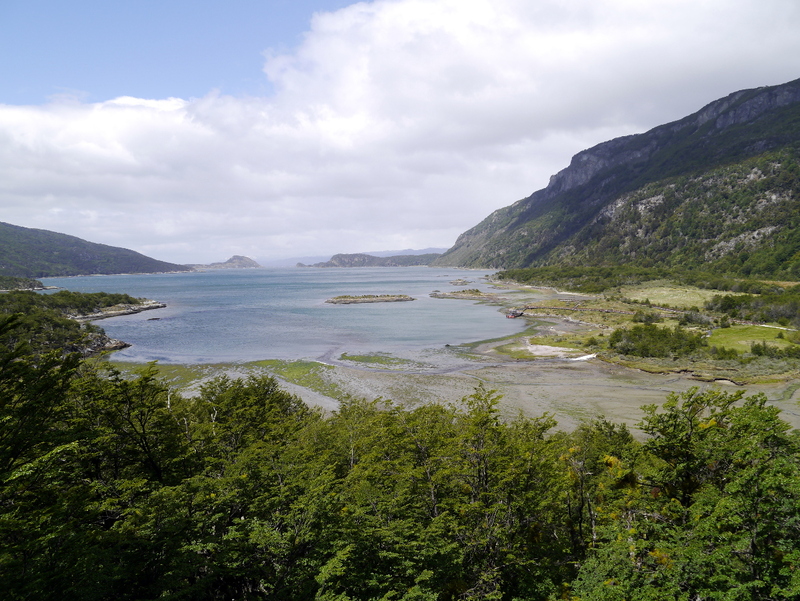 We explored the Ushuaia and visited the Museo Yámana and learned more about the indigenous tribes that originally inhabited Tierra del Fuego. The most striking thing is that they were able to live in this cold, harsh environment –naked! The frequent rain prevented their clothes from ever drying, thus being naked and using natural oils to insulate was a warmer option. The name Tierra del Fuego (Land of Fire) came to be because early European explorers observed that Yámana people carried a campfire with the wherever they went, even in their boats! It was interesting and I recommend a visit! 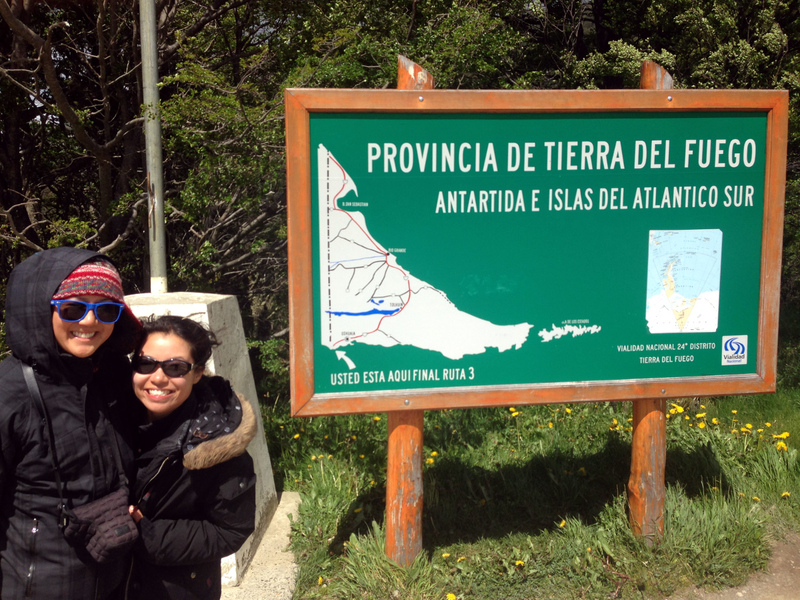 Goodbye Ushuaia, we still had one stop left: the king penguin colony. 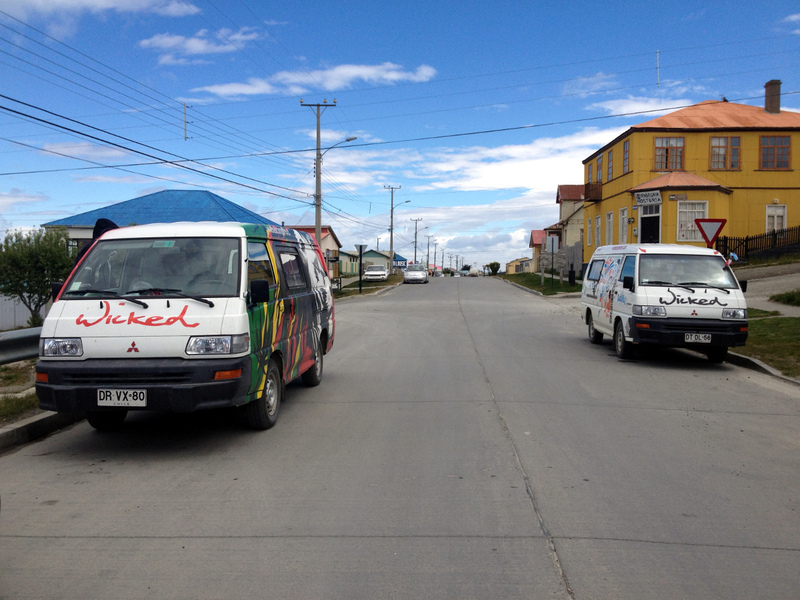 It had been too windy several days ago, but we were hopeful it would be better this time – back into Chile we went. Chilean customs do not allow any meat, vegetable, or wood products to be taken into the country. If customs contraband is found, failure to declare products can result in hefty fines (couple hundred dollars, even if it is one apple). In every attempt not to waste food, the meal before a border is a feast – everything that we have goes into the frying pan. With Marley’s marijuana exterior, of course we are inspected every time (the drug dogs are very cute and love dirty socks). We had done fairly well and only lost a few cloves of garlic (we always declare that we have goods which saves us any fee), but on the last crossing we had to say goodbye to Rose’s trusty hiking stick. Milo, I hope you are enjoying your life in no-man’s-land with the Chilean border control. King penguins! 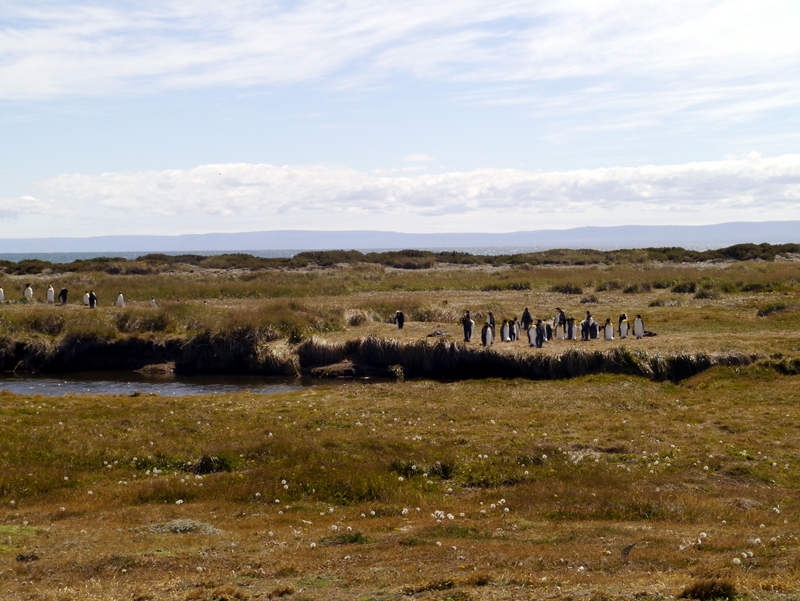 They were much larger than the Magellan penguins we had seen previously. They are the majestic, poised and almost intimidating. The king penguins were much further away than the Magellan penguins were, but what better way to close a trip than with penguins? Back across the ferry and over to Punta Arenas, our trip had come to an end! 2500 miles driven, 4 border crossings, 18 nights sleeping three-across in a van, 2 amazing travel companions and an amazing road trip of a lifetime. Thank you Rose, Matt and everyone we came across for such an unforgettable experience.